Pompeo’s Iran Speech a Prelude to War? The United States Secretary of State Mike Pompeo’s speech this past Monday targeting Iran may have created a new benchmark for hypocritical, arrogant, and entitled demands by the United States on foreign governments. The speech included gross misstatements regarding the seven-nation Joint Comprehensive Plan of Action on Iran’s nuclear program, which Trump Administration unilaterally abrogated earlier this month. More critically, it promised to impose “the strongest sanctions in history” against Iran, including secondary sanctions against governments and private companies which refuse to back the U.S. agenda, unless Iran changed a series of internal and regional policies. With the re-imposition of such sanctions, Iran will no longer have any incentive to stick to its part of the nuclear deal. 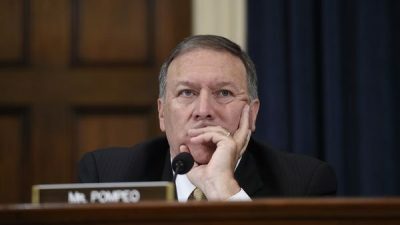 Most of the Iranian policies cited by Pompeo are indeed problematic, yet are hardly unique to that country. Furthermore, the failure to offer any kind of reciprocity effectively guarantees that the Islamic Republic will reject any changes in its policies. For example, Pompeo demanded that Iran withdraw its troops from Syria—which are there at the request of the Syrian government—but made no demand that Turkish or Israeli forces withdraw their troops from Syrian territory. Nor did he offer to withdraw U.S. forces. Pompeo similarly demanded an end to Iranian support for various militia groups in the region, without any reciprocal reduction of support for rebel groups by Turkey, Saudi Arabia, or the United States. And Pompeo demanded that Iran cease providing missiles to Houthi rebels, who have fired them into Saudi Arabia in response to Saudi Arabia’s bombing campaign and siege of Yemen. There was no offer to end the U.S. policy of providing the bombs, missiles, jet fighters to Saudi and Emirati forces which have killed many thousands of Yemeni civilians. Pompeo further demanded Iran provide “a full account of the prior military dimensions of its nuclear program,” despite the fact that this limited research effort ended more than fifteen years ago. Of course, there was no offer that the United States or its allies rein in their own nuclear programs. Israel, Pakistan, and India have never opened up their nuclear facilities to outside inspections, despite two U.N. Security Council resolutions calling on them to do so. Though most arms control agreements have historically been based on some kind of tradeoff, Pompeo insists that Iran unilaterally cease its ballistic missile program while making no such demand of Israel, Saudi Arabia, Turkey, Pakistan, or other allies in the region. Nor is there any offer to limit U.S. ballistic missiles, even though U.S. missiles are capable of striking Iran while no Iranian missiles have the capability of coming anywhere close to the United States. Perhaps the most hypocritical demand in Pompeo’s speech was that Iran “must respect the sovereignty of the Iraqi Government,” which the United States has repeatedly subverted for a decade and a half. In fact, Iran is already in compliance to some of Pompeo’s other demands, such as stopping production of enriched uranium and allowing the International Atomic Energy Agency full access to its nuclear facilities. The Iran nuclear pact already limits Iranian stockpiles to an extremely low enrichment level of 3.67 percent, well below the 90 percent needed for weapons production, and guarantees extensive and intrusive inspections of all nuclear-related facilities. No nation can be expected to comply with such unilateral demands, particularly coming from a country which is responsible for far more destabilizing policies, civilian deaths, and weapons proliferation in the region than is Iran. Pompeo made his demands knowing they would be rejected. And that may be part of a deliberate strategy. It’s not hard to imagine a scenario in the not-too-distant future in which the Trump Administration claims that since “sanctions didn’t work,” the only recourse is war.